Public Utility District No. 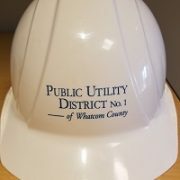 1 of Whatcom County is seeking a Substation Technician I to perform operations and maintenance activities required for the District’s electric substations and electric equipment associated with the District’s water treatment plants. Public Utility District No. 1 of Whatcom County is now accepting applications from qualified contractors wishing to be approved for listing upon the PUD’s 2019 Small Works Roster. The Port is teaming up with Public Utility District (PUD) No. 1 of Whatcom County to develop a strategic plan for improving broadband coverage to under-served areas throughout the county.